Hastings United have revealed a fee was agreed with Sunderland for Adam Lovatt on January deadline day - however a deal was unable to be completed in time. Hastings United have revealed a fee was agreed with Sunderland for Adam Lovett on January deadline day - however a deal was unable to be completed in time. 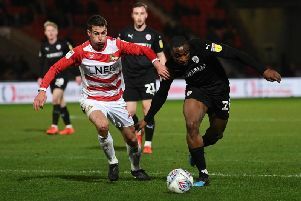 The midfielder has attracted interest from a host of Premier League and EFL clubs - including Leeds United - where he spent five days on trial in November 2018. Brighton and Hove Albion, Crystal Palace and Watford were other big names reportedly chasing his signature before the Black Cats made their move. However, a switch to the Stadium of Light could not be finalised as Sunderland had difficulties in getting Lovett’s medical completed before the window closed. Without the medical, the EFL did not have it in their power to rubber stamp the proposed transfer. Luton Town manager Mick Harford has confirmed his interest in Graeme Shinnie - although admits the club will face competition for his signature. The 27-year-old, who is the brother of Hatters star Andrew, will become a free agent in the summer when his contract expires. The Daily Express, this week, broke the news of Luton and Rangers's interest. He was also linked with Wigan Athletic and Sunderland in January. You can read what Harford told Luton Today HERE. Barnsley winger Ryan Hedges is being tracked by a number of Championship and SPL clubs, according to HITC Sport. The 23-year-old has hit the headline over the last few days following a man-of-the-match performance on his full Wales debut in 1-0 win over Trinidad and Tobago. It is believed a number of scouts were in attendance on Wednesday and Hedges, who has made 19 appearances for the Tykes this term, caught the eye. While he is out-of-contract in the summer, boss Daniel Stendel wants to keep the player, though is now expecting Hedges to receive offers from elsewhere. On loan Portsmouth striker Omar Bogle says he will consider a permanent move to the south coast. The 25-year-old, who joined from Cardiff City in January, has made a bright start at Pompey - scoring four goals in eight appearances. After having a nomadic couple of years with spells at Wigan, Peterborough and Birmingham, Bogle now wants to find a permanent home. And regardless if the Blues are promoted or not, Bogle is open to remaining at Fratton Park. HERE's what he told the Portsmouth News. Meanwhile, another loanee in Viv Solomon-Otobar is set to the club's Checkatrade Trophy final with Sunderland due to a calf injury. Blackpool manager Terry McPhillips has held "positive talks" with the club's new board about their plans for next season. Ben Hatton, Michael Bolingbroke, Ian Currie and Tim Fielding took the reins in the Seasiders boardroom following Owen Oyston's exit. Discussions have now been held on new contracts, recruitment and improvements to the Bloomfield Road pitch. You can read the full story from the Blackpool Gazette HERE.